Above: a sculptural relief from the Legionary fort at Mainz (in modern Germany). 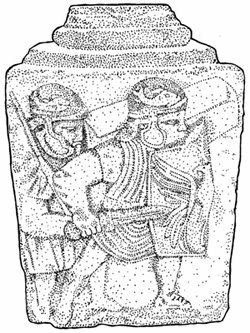 Although Roman shields evolved over the years, their principles of construction remained quite consistent. The Romans used the term, scuta to reffer to their shields (the singular form is scutum). The most familiar is the rectangular scutum commonly seen in movies. There were several shield varieties used by the Roman army. Long oval shields are often depcited on sculpturs of auxliares. Modern writers often refer to this shield as the clipeus, yet this term was used by the Romans only to describe the dished circular shield carried by the Greek hoplite. 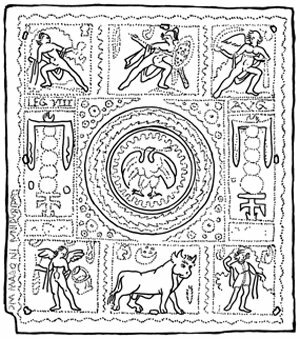 The Romans had their own circualr shield known to them as the parma. It's small size made it the prefefered shield of the encumbered standard bearers. In the Republic and early-mid Empire the main body of the scutum was constructed of plywood. Three layers of wood glued together with the grains at right angles for added strength. Vertical strips faced the front and the back, while horizontal strips were sandwhiched in between. In the later Empire shields were frequently made with vertical wooden planks, rather than plywood. A liquid hide glue was probably used. The resulting thickness of the plywood was roughly 1/4 to 3/8 inches. Birch and oak were frequently used woods. Presumably because they are less likely to splinter when struck. The outer and inner surface were covered with painted cloth (linen, felt, canvas) or leather. The outer rim of the scutum was often edged with nailed strips of bronze. Fragments of this edging have been found at numerous 1st century archaeological sites. One would think that the metal would be helpful in countering the slashing strike of an enemy's weapon. Suprisingly, the finds show the metal to be too thin (less than 1/32 inch think) to be anything more than a decorative element. Toward the third-century the more economical rawhide was stitched on, rather than the metal. The corners were most often rounded with metal edging. However, square corners were easier when using the leather. Some shields had no edging at all. Horizontal lengths of hardwood, were glued and nailed to the back. These wood strips were 1/2 to 3/4 inches wide and about 1/4 inches thick. One of these strips formed the handgrip in the center of the shield. It was 3/4 inches wide and 1/4 thick for most of the length. In the middle (where the hand gripped) it was 3/4 inches thick, rounded and sanded or wrapped with leather. The handgrip could also be a steel strip about 1/8 inches thick. The shield probably had carrying-strap attachments. A hole roughly 5 inches in diameter was cut in the center of the shield to give a place for the hand. The hole was covered on the front by a domed metal boss, or umbo. This was made of sheet iron or bronze. This dome was at the center of a round, rectangular or hexagonal metal plate (flange) which could be roughly 8 inches square to 10 x 11 inches. The entire unit was riveted into place. Judging from sculptural evidence, it appears the Romans made an effort to match up the general shape of the boss with the shape of the shield. 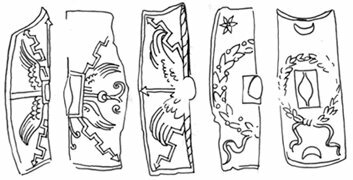 Legionary shield blazons from Trajan's Column. 1. Greece and Rome at War, by Peter Connolly. 2. 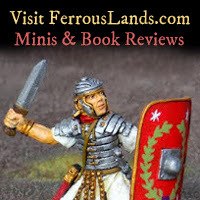 Roman Military Equipment by M.C. Bishop, J.C.N. Coulston. 3. In the 1960s several shield fragments were found at Masada, and published in Masada VIII, The Yigael Yadin Excavations. Israel Exploration Society. 2007.